David A. Robertson is an award-winning writer. His books include When We Were Alone (winner Governor General's Literary Award), Will I See? (winner Manuela Dias Book Design and Illustration Award Graphic Novel Category), Betty, The Helen Betty Osborne Story (listed In The Margins), and the YA novel Strangers. David educates as well as entertains through his writings about Indigenous Peoples in Canada, reflecting their cultures, histories, communities, as well as illuminating many contemporary issues. David is a member of Norway House Cree Nation. He lives in Winnipeg. 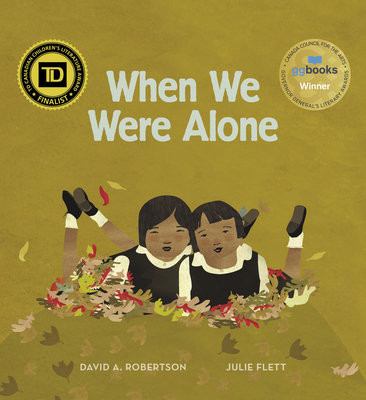 Julie Flett is an award-winning Cree-Metis author, illustrator and artist. She has received many awards, including the 2016 American Indian Library Association Award for Best Picture Book for Little You, written by Richard Van Camp (Orca Books), and the Canadian Christie Harris Illustrated Children's Literature Award in 2015 for Dolphins SOS, written by Roy Miki (Tradewind Books) and in 2017 for My Heart Fills with Happiness, written by Monique Gray Smith (Orca Books), and was nominated for the Governor General's Award for Children's Literature for her book Owls See Clearly at Night (Lii Yiiboo Nayaapiwak lii Swer): A Michif Alphabet (L'alphabet di Michif). Her own Wild Berries (Simply Read Books) was chosen as Canada's First Nation Communities Read title selection for 2014-2015.